Kentucky quarterback Stephen Johnson, left, was the backup to Drew Barker early last season, including during this 45-7 loss at Florida. But the Grambling transfer took over the starting role and guided the Wildcats to the TaxSlayer Bowl. Kentucky football fans had been through the song and dance before. After two consecutive 5-7 seasons, the Wildcats appeared to be headed for another bowl-free Christmas season when they opened their 2016 schedule with a 44-35 home loss to Southern Mississippi and a 45-7 throttling at Florida. 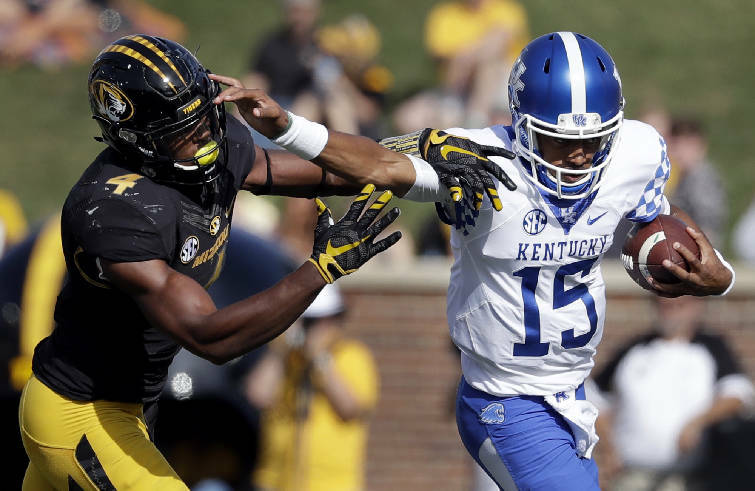 Yet an unusual thing happened after Kentucky's 2-3 start — the Wildcats won tight home games against Vanderbilt and Mississippi State before winning by two touchdowns at Missouri. Kentucky qualified for its first bowl since 2010 with a 49-13 whipping of Austin Peay and clinched its first winning season since 2009 win a 41-38 monster road upset of Louisville in the regular-season finale. Suddenly there is a brand new outlook in Lexington, where the Wildcats return a whopping 17 starters from last year's 7-6 team that came up short against Georgia Tech in the TaxSlayer Bowl. "We do feel a sense of more respect," Kentucky senior quarterback Stephen Johnson said last week at the Southeastern Conference's media days event. "We won a tough game against Mississippi State (40-38) and a tough game against Louisville. Those two games in particular caught people's eyes and let people know that Kentucky is a contending team. "Our confidence going through this summer is a lot higher than it was last summer. We know now that we can win big games in tough situations and not just die down in the fourth quarter. I'm excited for what we have in store." What appeared to be in store for Johnson last summer was backing up Drew Barker, but Barker injured his back on the first series of the third game (New Mexico State) and never returned. Barker underwent surgery and is back for the Wildcats, but he's the backup now. Johnson was in his first season at Kentucky last year after starting his college career at Grambling and then transferring to College of the Desert in Palm Desert, Calif., where he spent the 2015 season. › Fun fact: The Wildcats went a combined 23 games under .500 in the six seasons that preceded last year’s winning mark. As a result of those struggles, Kentucky has slipped under .500 all-time with a 599-612-44 mark. When the door opened last September, Johnson broke through by completing 145 of 265 passes (54.7 percent) for 2,037 yards and 13 touchdowns. He also rushed for 327 yards and three scores. More importantly, Johnson led the Wildcats to a 3-1 record in games decided by a touchdown or less, with only a 27-24 home loss to Georgia going against them. "I think if you watched some of our close games last year, some of our victories, he made critical plays by any means necessary," Kentucky fifth-year coach Mark Stoops said, "and that's a winner. He pulled it down and ran or scrambled to buy time to throw the ball down the field and was just efficient and improving his passing game and his accuracy — he did all those things. "He's a good player. Stephen will tell you he's got a lot of work to do to improve, and he intends to do that this summer." In the win at Louisville, Johnson connected with Garrett Johnson for a 75-yard pass on Kentucky's first play from scrimmage. He went toe-to-toe with Cardinals counterpart and eventual Heisman Trophy winner Lamar Jackson, throwing for 338 yards and three touchdowns and rushing for a career-best 83 yards for 421 yards of total offense. Johnson had a touchdown rushing and passing in the bowl game, and he should again form a formidable tandem with running back Bennie Snell, who rushed for 1,091 yards to average 5.9 yards per carry as a freshman. Though the Wildcats were picked fifth last week in the SEC East, they harbor much higher expectations after last season's long-awaited return to the bowl scene. "We have a bunch of goals, and we take one step at a time to achieve those goals," Johnson said. "Right now we have our mind set on Southern Miss, but our goal is to win the SEC East and the SEC." That may seem outlandish for a program that hasn't had a winning record in SEC play since 1977, but if Johnson had made a life settling for things, he would have already finished up his college career at Grambling. "I could not have imagined all this," Johnson said. "There were nerves all the time going into those first few games, and I was glad that I had the support of my team behind me going through that. That made the transition not as hard as it should have been. "It's really surreal how it all came about."